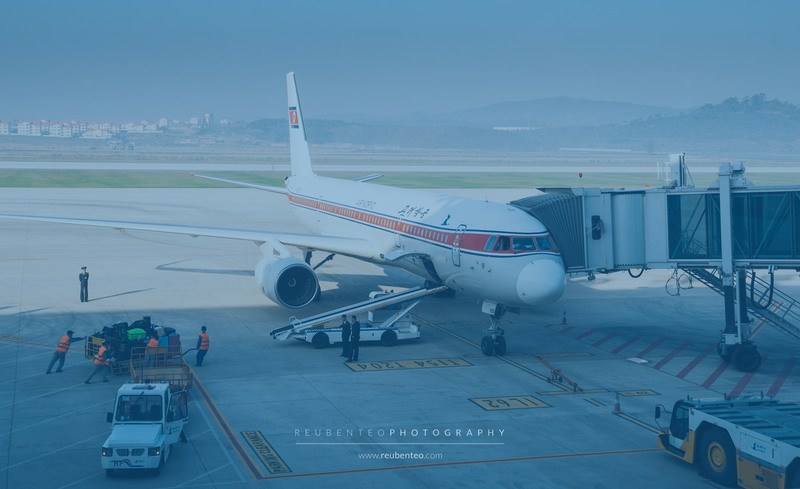 Flying in to North Korea via Air Koryo from Beijing is still the quickest and most convenient way for tourists to enter the country. Flights are also available from other cities in China and even Russia. They also provide a great opportunity for you to get your first taste of North Korea by flying with Air Koryo. Enter the plane and you are greeted with North Korean popular music, and read North Korean newspapers and magazines from the trolley. You can sample North Korean beers and soft drinks. The on-board staff are friendly and professional. You can also exit the country with Air Koryo, or take a domestic flight. The newly-renovated (2015) Pyongyang International Airport is North Korea’s international flight hub, and Air Koryo’s base. See below for flight timetables. Flights can be chartered to Harbin, Guangzhou and other cities in China. Contact us for more details. Flights can also be chartered to Moscow and Bangkok, Thailand, Kuala Lumpur, Malaysia, Kuwait City and other cities. Contact us for more details. It is also possible to charter flights with Air Koryo. If you have a large group, you can split the cost between all members allowing for some incredible itinerary options that will let you see far corners of the country quickly and conveniently. You can fly between Pyongyang, Mount Paektu, and Chongjin. Contact us for more details. Trains offer a cheaper and more scenic method of travelling into, out of, and within North Korea. The train route runs from Beijing, through China’s Northeast, and then across the Yalu or Amnok River, which forms the border between China and North Korea. It goes through Dandong on the Chinese side and Sinuiju on the North Korean side, before approximately five hours of the North Korean countryside in between Sinuiju and Pyongyang. The contrast between the Chinese and North Korean sides of the Yalu/ Amnok River is fascinating. There’s also something extra special about crossing an international border by land. The scenery in between Sinuiju and Pyongyang is absolutely wonderful. In winter the mountains, plains, and rivers form a fairytale-like snowscape. In the other seasons the fields are lush, green and ripe with crops. The route passes through many ordinary towns and villages, allowing travellers to catch a fascinating glimpse of everyday life in North Korea. The train trip also provides an excellent opportunity to interact with the others on board. Rub shoulders and chat with North Koreans, Chinese, and other tourists and foreign visitors to North Korea. Beds are provided to sleep overnight in between Beijing and the Northeast of China. Meals can be bought on board in the restaurant carriage or brought on board. See the train timetable below. It is also possible to get a train from Moscow to Pyongyang, or from the Russian Far East to Pyongyang. The Moscow-Pyongyang international train runs two times a month, departing on the 2th and 19th. The Khabarovsk-Dumangang (Northeast DPRK) train departs one time a month, on the 23rd. The Moscow-Dumangang train (Ussrisk-Dumangang train) departs on the 8th, 12th, 24th, 28th in January, February, April, May, June, July, August, September, October, November and December. In March the train runs on the 1st, 9th, 13th, 25th. Please note that these seats generally need to be booked at least two to three months in advance. It is also occasionally possible to take a domestic train from Pyongyang to Mount Myohyang, or Pyongyang to Chongjin in the far northeast. Contact us for more details. When visiting the North Hamgyong Province and Rason in the far northeast of the country, it is also possible to enter by bus or even on foot. You can enter by bus into Rason City, or cross in by foot over the bridge connecting Tumen City on the Chinese side of the Tumen River and Namyang on the North Korean side. Contact us for more details.